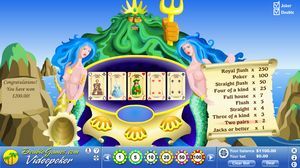 The king of seas rose from deep waters and made himself comfortable in rocks to offer you the game Island Videopoker.The goal of the player is to collect five cards which will make winning combination. This game is easy and interesting to play. Its attractive topic, unusual design and special music have many worshippers now! The king of seas rose from deep waters and made himself comfortable in rocks to offer you the game Island Videopoker. Look at him he will impress with his appearance any person who watches him. He is strong, his beard is green and vast and he has the unbounded power. Two blue-haired charming water-nymphs, his daughters, help their father. One of them is holding the list of win combinations of this videopoker game. Another mermaid is supporting a shell. If you win all your money will pour out of it as out of horn of plenty!The goal of the player is to collect five cards which will make winning combination. This game is easy and interesting to play. Its attractive topic, unusual design and special music have many worshippers now!